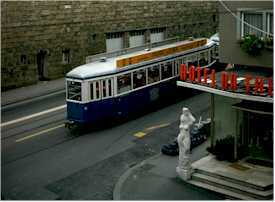 ABOVE: Someday, this older Zurich tram could end up as a rolling fast-food emporium, snack bar, or Confiserie. In Switzerland, first-rate public transportation is considered a birthright. The country is criss-crossed by railroads, boat routes, funiculars, aerial cable cars, Postal Bus routes, and--in the larger cities--extensive networks of buses and trams. One might expect the Swiss public-transportation authorities to sit on their laurels. But no; transit authorities like Z�rich's VBZ and Geneva's TPG are always looking for new ways to improve their service, whether it's by offering whimsical rolling stock like the Titanic-Tram (VBZ) or earning the coveted ISO 9001 quality certification (TPG). And in recent years, they've offered something even more intriguing: tram restaurants that serve meals while touring the town.